The "Cover Your Assets" Skirt - It's Skirt Week! I have a slight obsession with running clothes. It helps that there are some really cute, functional styles out there - even some of the C9 from Target has made it's way into my running wardrobe! But not only do I love these pieces for running, some of them are cute enough to wear around town. The only problem with pulling on a pair of running capris for a trip to the post office is that, well, I'm wearing running capris. They are cute and comfy, but I'm not crazy about flashing my assets - especially the less than perfect assets that get me running in the first place. While I was window shopping at one of my favorite stores recently, I found this cute skirt. It looked adorable on the mannequin, but $50 is a hefty price for a knit skirt that has no technical properties (i.e. wicking fabric, or pockets for storing an ipod). I left the store empty handed, and haven't stopped dreaming of that skirt since! I finally attempted to sew a knock-off skirt and while it's different from the original, I love it! I used some super soft pink burn out knit that I had in my stash, left the hems unfinished, and used some 1" elastic for the waist. The burn out effect in the knit leaves it sheer in some areas, which was just a good excuse for using 2 tiers of knit! I also cut the back slightly longer, a trick I learned after studying my running skirts. Such a simple detail, and it makes a big difference! I'm really excited about this simple skirt, because now all of my black running capris have double the use! 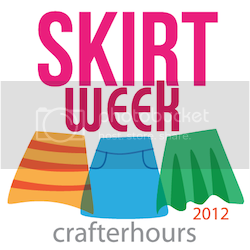 Be sure to check out Skirt Week over at Crafterhours! To enter a skirt, use the buttons at the top right side of their blog. And hop over here to enter a giveaway on my blog!